Cherilyn Sarkisian, popularly known as Cher is an American singer and actress. She is referred to as the Goddess of Pop. She rose to prominence in 1965 as one-half of the folk-rock husband-wife duo Sonny & Cher. She is known for her distinctive contralto singing voice and for having worked in numerous areas of entertainment during her six-decade-long career. She also pursued her solo career simultaneously in 1966. She is one of the best-selling music artists of all time, having sold 100 million records worldwide to date. She became a television personality in the 1970s becoming a fashion trendsetter. She made her Broadway debut in 1982 and has appeared in numerous critically acclaimed films. She has won numerous accolades including a Grammy, an Emmy, an Academy, 3 Golden Globes, among others. She is also known for her political views, philanthropic endeavors, and social activism, including LGBT rights and HIV/AIDS prevention. She has over 1.1 million followers on her Instagram. What is Cher Famous For? - Referred to as the Goddess of Pop. - One of the best-selling music artists of all time. - Only the artist to have a number-one single on Billboard chart in six consecutive decades from the 1960s to the 2010s. Cher was born on 20 May 1946. Her birth name is Cherilyn Sarkisian. She was born to a father, John Sarkisian, and a mother, Georgia Holt. Her birth place is in El Centro, California in the United States. She holds American nationality. Her zodiac sign is Taurus. Her father was an Armenian-American, whereas her mother was of Irish, English, German, and Cherokee ancestry. Her parents got divorced when she was 10 months old. Her mother later married actor John Southhall. She has a half-sister named Georganne from her mother's second marriage. Her mother was an occasional model and bit-part actress and secured acting parts for her daughters as extras on television shows. Her mother and Southall parted their ways when she was 9 years old. Her mother married bank manager Gilbert LaPierre. LaPierre adopted Cher and Georganne and enrolled them at Montclair College Preparatory School in Encino. She was intelligent and creative in school. She excelled in French and English classes. She dropped out of school at the age of 16. She left her mother's house and moved to Los Angeles with a friend. After she moved to Los Angeles, she took acting classes. To support herself, she worked as a dancer in small clubs. She met performer Sonny Bono in November 1962. Sonny was working for record producer Phil Spector. Spector produced her first single, "Ringo, I Love You". Her first single was commercially unsuccessful. She recorded her first single under the name Bonnie Jo Mason. Sonny wanted to launch Cher as a solo artist, but she encouraged him to perform with her because she suffered from stage fright. They emerged as a duo called Caesar and Cleo in late 1964. The duo's debut single is "The Letter". Their single "Do You Wanna Dance? ", "Love is Strange", and "Let the Good Times Roll" was poorly received. The couple began calling themselves Sonny & Cher in early 1965. They rose to prominence after the duo's single, "I Got You Babe" reached number one on the American and British charts in 1965. She simultaneously pursued her solo career in 1964. Sonny and Cher's first album, Look at Us was released in 1965. Her debut album, All I Really Want to Do was released in 1965 and reached number 16 on the Billboard 200. Sonny and Cher charted 10 Billboard to 40 singles between 1965 and 1972, including 5 top-10 singles, "I Got You Babe", "Baby Don't Go", "The Beat Goes On", "All I Ever Need Is You", and "A Cowboy's Work is Never Done". She formed a band called the "Black Rose" in the early 1980s. The band released their first and only self-titled album, Black Rose. She took a hiatus from music around 1982 to focus on her acting career. She returned to music in 1987. She has sold over 100 million records worldwide to date. As a duo, Sonny & Cher has released 5 studio albums, 4 compilation albums, 1 soundtrack album, 2 live albums, and 21-singles. They had sold 40 million records worldwide. As a solo artist, she has released 26 studio albums, 9 compilation albums, 4 soundtrack albums, and 3 live albums. She has 4 number 1 singles, 12 Top 10 singles, 22 Top 40 singles, and a total of 33 charted singles as a solo artist. As the duo Sonny & Cher, they have 5 number 1 singles, 17 Top 10 singles, 32 Top 40 singles, and a total of 51 singles which charted on the Billboard Hot 100. Her 2005 Farewell Tour is one of the highest-grossing concert tours of all time earning $250 million. She made her acting debut in Television in 1967 television series, The Man from U.N.C.L.E. She made her film debut in a minor film in the 1965 film, Wild on the Beach. She moved to New York in 1982 to take acting lessons with Lee Strasberg but never enrolled after her plans changed. She made her Broadway debut in Robert Altman's Come Back to the Five and Dime, Jimmy Dean, Jimmy Dean in 1982. Her major films are Chastity, Silkwood, Mask, Suspect, The Witches of Eastwick, Moonstruck, Mermaids, Faithful, Tea with Mussolini, Stuck on You, Burlesque, Mamma Mia! Here We Go Again, among others. She is one of the few artists to win three of the four major American entertainment awards (EGOT - Emmy, Grammy, Oscar, and Tony). Cher has won a Grammy Award, an Emmy Award, an Academy Award, three Golden Globe Awards, a Cannes Film Festival Award, among others. Her honorary awards includes the 1985 Woman of the Year Award by the Hasty Pudding Theatricals society at Harvard University, the Vanguard Award at the 1998 GLAAD Media Awards, the Legend Award at the 1999 World Music Awards, a special award for influence on fashion at the 1999 CFDA Fashion Awards, the Artist Achievement Award at the 2002 Billboard Music Awards, the Lifetime Achievement Award at the 2010 Glamour Awards, the Legend Award at the 2013 Attitude Awards, the Award of Inspiration at the 2015 amfAR Gala, the Icon Award at the 2017 Billboard Music Awards, and the 2018 Kennedy Center Honor. She received the honor of placing her handprints and footprints in cement in the courtyard in front of Grauman's Chinese Theatre in Hollywood in 2010. She has a star on the Hollywood Walk of Fame as part of the duo Sonny & Cher. Who is Cher Married to? Cher first married American singer-songwriter, producer, actor, and politician Sonny Bono. They first met in November 1962. They performed their own unofficial wedding ceremony in a hotel room in Tijuana, Mexico, in October 1964. They got married in 1969. The couple had one child, Chaz Bono. Chaz came out as a lesbian at the age of 17. The couple had marital problems since late 1972. Sonny filed for separation in 1974 and their divorce was finalized in June 1975. During her divorce proceedings, she had a two-year romantic relationship with record executive David Geffen. Four days after finalizing her divorce from Sonny, she got married to rock musician Gregg Allman on 30 June 1975. She filed for divorce from Allman just nine days later of her marriage. She filed for divorce because of his heroin and liquor problems. But, they reconciled within a month. The couple had one son, Elijah Blue, born in 1976. The couple later got divorced in 1979. Her first husband, Sonny Bono died in a skiing accident in 1998. She received controversies for her lifestyle, her tattoos, plastic surgeries, exhibitionist fashion sense, and affairs with younger men including Val Kilmer, Eric Stoltz, Tom Cruise, Ron Duguay, Josh Donen, Richie Sambora, Rob Camilletti, among others. What are Cher's Body Measurements? Cher stands at a height of 1.74 m i.e. 5 feet and 8 and a half inches tall. She has a body weight of 134.5 lbs i.e. 61 kg. She has a slim body build. Her body measurements are 36026036 inches. She has hazel eyes and her hair color is black. She wears a dress of size 8 (US) and shoes of size 8 (US). She has 6 tattoos on her. What is Cher's Net Worth? She has endorsed numerous brands and has starred in infomercials launching health, beauty, and diet products. As a fashion trendsetter, she has ventured into the fashion industry as well. Her 2005 Farewell Tour is one of the highest-grossing concert tours of all time earning $250 million. Her role model was Audrey Hepburn. She discovered as an adult that she had dyslexia. Rolling Stone listed "I Got You Babe" among "The 500 Greatest Songs of All Time" in 2003. Journalists have often called her the "poster girl" of plastic surgery. Madame Tussauds wax museum honored Cher as one of the five "most beautiful women of history" by creating a life-size statue in 1992. VH1 ranked her at number 26 on the list of "100 Sexiest Artists" in 2002. She is considered a gay icon. 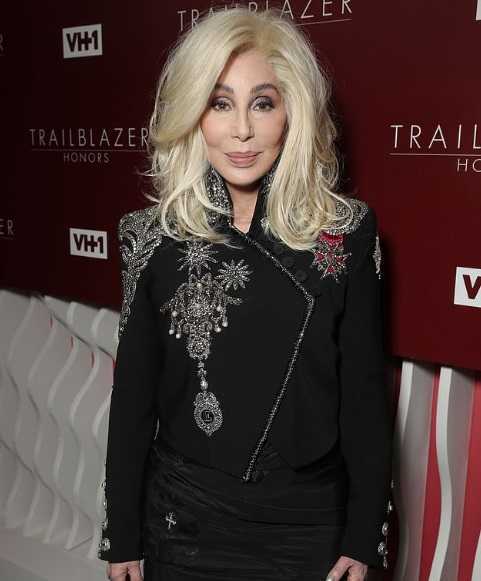 The Cher Charitable Foundation supports international projects such as the Intrepid Fallen Heroes Fund, Operation Helmet, and the Children's Craniofacial Association. She is a donor, fundraiser, and international spokesperson for an organization, Keep a Child Alive.